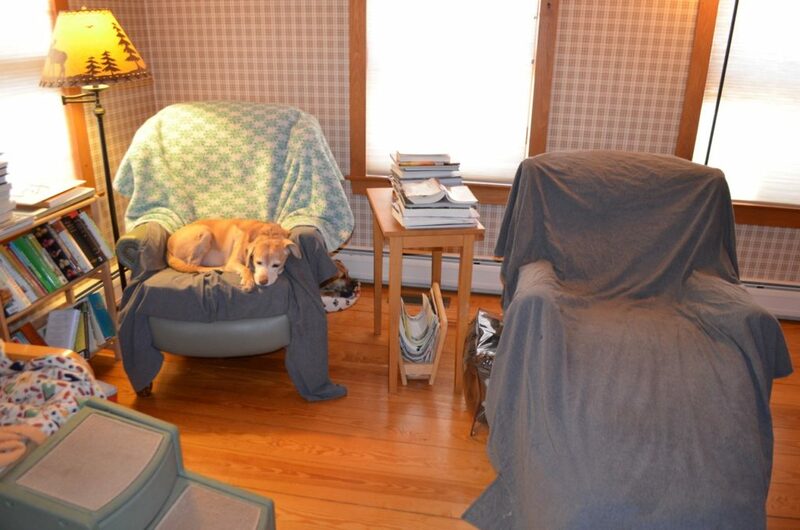 Long-time blog readers may recall the ongoing saga of?”the chair” — specifically, my 21-year?old beloved recliner that was off-limits to dogs until Darla claimed it as her own‘soon after she arrived back in 2013. Darla and I continued to do battle over whose chair it really was. This contest of wills went on for almost two years until I finally gave up in 2015 and bought a brand-new recliner for myself, relinquishing the old one to her. As you can see, both of the other chairs are empty, but she still went for my new recliner. Darla?knows she can get away with just about anything (I confess to being a complete push-over when it comes to this dog! ), but I’ve told her she’s pushing her luck here. Oddly enough, Tanner had never gotten into that recliner until he saw our new arrival, blind Millie, start doing it a few weeks ago. Now he’s in it quite often. But no, I am NOT buying another recliner! Shelter Challenge — $1,000 Win for the Dogs! 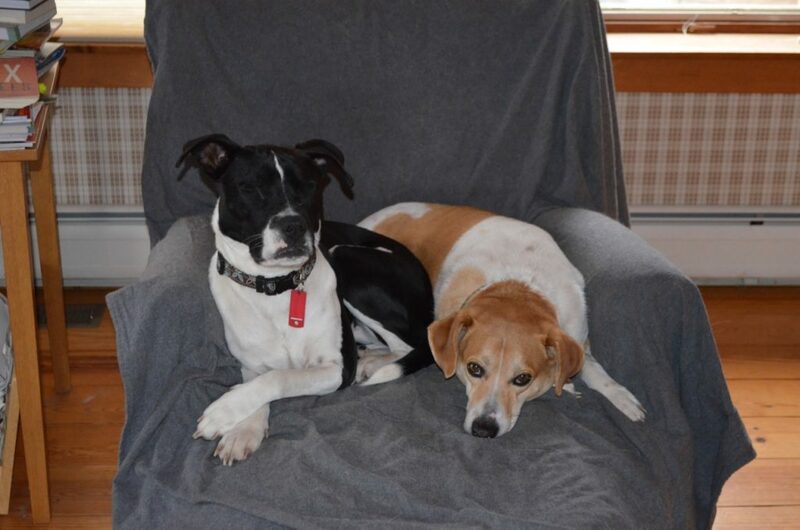 Thanks to your votes, we came in first in New Hampshire again in the latest round of the Shelter Challenge, winning another $1,000 for our disabled dogs. Thank you so much for all your dedicated voting! You’d have to invest in a furniture company to stay ahead of these guys!! Glad you got the $1000. It all helps! Have a happy day. Love to all those beautiful babies. HA! So you still think furniture is for people when their are pets around?…after all these years! Hahahahahahahahaha. They are a charming bunch Good thing it is Spring and you won’t be in the house very much for awhile. It’s amazing sometimes what we will let our animals get away with because we know it means something to them. Good luck finding a place to sit and relax! Darla is very spoiled. But I think she needs a talking to about Daddy’s chair. Millie is such a good looking dog. Seems like her paws are always crossed in photos, making her even cuter! I wonder how she feels about Tanner joining her like that? And how did she even know that chair is available since she can’t see? Do they just stumble upon the doggie steps then try them out to see where they lead? It’s amazing. They certainly have you where they want you, twisted around your little finger. I love the picture of Millie with her two front paws crossed over each other. Everyone loves a warm spot that has owner smell on it! They’re really saying they want to be close to you, but don’t actually need your presence to feel safe and secure. Perhaps a pillow on the floor……..won’t say for whom! Congratulations on your win! Tanner and Millie are cute snuggling together. You know, of course, that whichever chair is yours, that’s the one Darla wants. The question is, does she pick your chair in order to feel closer to you, safe and secure? or is she just stealing your chair to show you who’s boss? 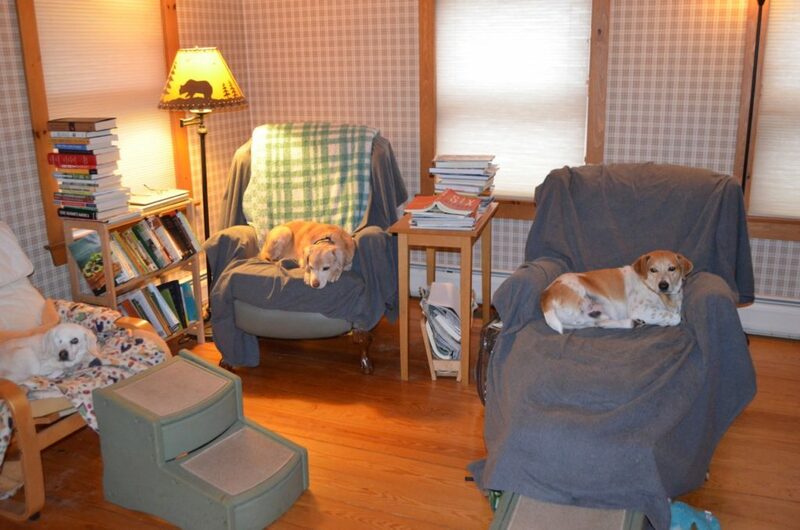 Hmmm…..
Who is in the dog bed behind your recliner in photo #2? Please forgive the expression, Steve, but I think you’re up sh * t creek , but I know you have a paddle ! The pirates have mutineed !